"What is your opinion on wearing white after Labor Day?" Well, to answer your question, it's perfectly A-OK to wear white after Labor Day. That old rule went out with the jerk. The real issue is the type of fabrics you have in your wardrobe when summer transitions into Fall. Please note that any linen, no matter if it's brown, black, cream, or white, should be put away. 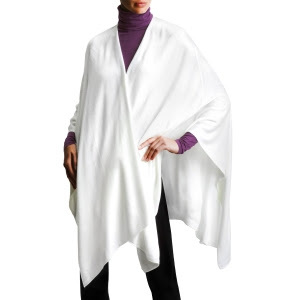 The key is to go with a thicker, more Fall/Winter appropriate fabric, like wool, and a slightly different shade of white, like winter white (it does exist people), to allow white to gleam fabulously in the cooler seasons. Don't put away white jeans but imagine pairing them with a chunky, dark knit sweater and boots. Just remember to keep white as a monotone color and don't wear "white and navy stripes" or "white and yellow" because that is an instant reminder of Spring/Summer. 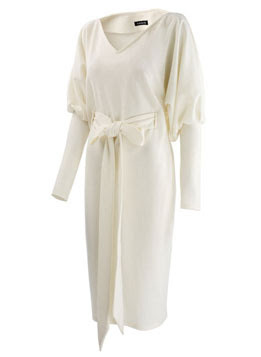 You can surely stand out in the Fall/Winter season by pairing a long white wool coat with a black sweater dress. The contrast is beautiful and classy and will definitely draw fashion admirers. This dress is for the grown woman in you, don't be scared, lol.